The HCID initiative has brought to light six areas where the move from commitment to meaningful action needs to be made a priority by all concerned. For each area, the HCID initiative has identified recommendations and practical measures to guide the actions of relevant actors. They address a number of aspects relevant to the prevention of violence against health care and to the reduction of the impact of insecurity on the safe access to and delivery of health care. The HCID recommendations and measure are the fruit of a two year long process which involved consultations and dialogue with many different actors: state authorities, militaries, armed groups, international professional associations, health-care workers, humanitarian organisations, civil society and religious leaders and many more. They aim at generating respect for international humanitarian law, the humanitarian space and the life-saving mission of health services. The implementation of the HCID recommendations and specific measures identified in the six areas can help countries to strengthen the protection of health care personnel, facilities and transport, help to build the resilience of their national health care system and ensure safer access to health care and its impartial and effective delivery particularly during armed conflict or other emergencies. The HCID recommendations and concrete measures in this area aim at helping states reinforce their domestic legislation and comply with their obligations in terms of implementation of the existing international framework protecting health care delivery and services. The HCiD recommendations and measures are set out in the publication entitled “Domestic Normative Frameworks for the Protection of Health Care”. The HCID recommendations and measures in this area have been identified together with experts from military forces. They are aimed at minimizing the disruption to health-care services and preserving the right of patients to receive health-care and of health personnel to provide it safely while safeguarding the legitimate security concerns of fighting forces. c. Military operations in the proximity of a health care facility. The HCiD recommendations and measures are set out in the publication entitled “Promoting military operational practices that ensure safe access to and delivery of health care”. The HCiD recommendations and measures in this area have been identified through a consultation process with more than 30 armed groups around the world. They are aimed at minimizing the disruption to health-care services and preserving the right of patients to receive health-care and of health personnel to provide it safely. To this end, the Health Care in Danger project offers a Model Unilateral Declaration that armed groups can adopt to declare their intention to support and protect safe access to health care. As well as in the e-learning module “The rights and responsibilities of health care personnel working in armed conflicts and other emergencies”. 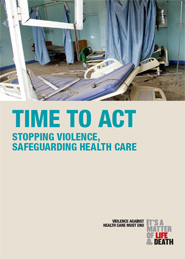 The recommendations and measures in this area are addressed to governments, hospital managers and other individuals concerned, with a view to helping them prepare for and manage situations that could jeopardize their objective of assisting the sick and wounded, and maintaining the health of people affected by armed conflict and other emergencies. They cover a broad range of subjects – facilities, supplies, health-care personnel, and patients and their relatives – and place a strong emphasis on preparedness and planning to make the delivery of health-care safer. e. measures to adopt in the event of temporary relocation. The HCiD recommendations and measures are mostly set out in the publication entitled Ensuring the Preparedness and Security of Health-Care Facilities in Armed Conflict and Other Emergencies. The recommendations and measures in this area are addressed to first aiders, ambulance drivers and all those first responders who are often on the front lines to assist and collect sick and wounded people, and are therefore exposed to violence directly and indirectly. They build on the experience of National Red Cross and Red Crescent Societies, in particular on the Safer Access Framework. d. measures to increase operational risk management. The HCiD recommendations and measures are mostly set out in the publication entitled Ambulance and Pre-hospital Services in Risk Situations. The recommendations and measures in each specific area are generic in nature and should be adapted to the needs and resources of your country or situation. They should be used holistically as part of a comprehensive strategy for the protection of health care.